You can use the Free spins only on the following games: Starburst, Aloha! Cluster Pays, Pyramid Quest for Immortality and Joker Pro (“Promotion Games”). Power Spins might well be a brand new online casino for 2017, but there’s a wealth of experience behind its development. That’s because it’s the brainchild of the same folk who operate BGO, one of most popular gaming sites in the UK. We have no idea if BGO’s ‘The Boss’ character has anything to do with it, but his mush is noticeably absent from the site. Instead, a modern casino design full of sharp fronts and bold graphics hosts a great range of games. There are some interesting design concepts that distinguish Power Spins from its peers too. How does it compare as an overall offering though? I suppose I’d better tell you. Let’s start with the visuals and there’s very little to quibble about there. There’s no specific theme as such, but The Power Spins Casino is a bold, vibrant and impressive online casino. The site’s logo features a small bolt of lightning, which pops up when you’re loading a new page. If that’s suggestive of energy, then the same concept is reflected in the design of the site. The homepage is busy without being cluttered. Streaks of fork lightning sit atop a vivid blue background, and the design team use sharp, striking fonts to give the site a distinctly contemporary atmosphere. That said, the structure of Power Spins is largely traditional. The games are arranged in simple thumbnails on a rectangular grid. There’s a top menu (which admittedly contains some unusual menu options) and a banner indicating the latest promotions. That the site’s background changes with the banner to reflect the advertised bonus is a nice touch. The My Account section is attractively designed and there are handy little help links scattered about the place, which pop up as information boxes that are super easy to read. Power Spins is the sort of online casino that we like to look at. It’s a welcoming, exciting environment to play your favourite casino games. The pretty visuals aren’t used to mask any usability deficiencies either. Power Spins Login page functions well and you can navigate your way around the site from first visit. The registration process is equally straightforward. You proceed through three pages all asking for scant details (only the ‘gender’ question will offer any surprises at all) and you ultimately directed to the deposit section, which you can skip to you want to do so. You can’t play any games in free play mode, so there’s half a mark off for that. But the Power Spins team more than make up for that in other areas. We haven’t come across an online casino that gives such precedence to customer support before, but it’s a good indicator in our book. The top menu features links to a comprehensive help centre, live chat and even the service telephone number, which pops up when you click on it. You won’t have any problems finding support should you need it. Not that you will necessarily. Everything is clearly explained at Power Spins and we had no issues finding or using any of the functions on the site. There are a few unique entries too, like the ‘Power Bar’ that sits at the top of the page and the ‘Vault’ that opens up when you click on the lightning bolt at the top of the page. Those two features are linked. Every wager adds some juice to the power bar, and when it reaches the maximum level, you receive a treat that’s added to your vault. You enter the vault to exercise your rewards. We really like the way Power Spins explain all this, as well as other elements of the site. All too often, online casinos employ a team of fantastic designers and even an army of UX experts, but then go ahead and neglect content. Not Power Slots, though. They used their words effectively and efficiently so that players understand all aspects of the online casino. Power Spins features a sizeable collection of the very best online slots and other casino games. They’ve partnered with leading game developers NetEnt, IGT Wagerworks, Playtech and Barcrest, who collectively provide a vast and varied catalogue. Many of their promotions, including the welcome bonus, are attached to NetEnt games so it’s no surprised to see a near complete suite of those in stock. We’re pleased that Playtech make an appearance too. Their games sometimes seem hard to find, but no so at Power Spins. Indeed, their presence swells the site’s jackpot slot selection because Playtech offer loads of them. NetEnt giants like Mega Fortune are available to play as well. In total, Power Spins hosts about 570 different games. The vast majority of those are slots, but there are 30 odd table and card games available too. There’s no live casino for those who like their action beamed in from a bricks and mortar establishment, though. Now, the games collection isn’t the biggest but it certainly isn’t the smallest either. For that reason, it would benefit hugely from a few more filtering options. Those of you who have read my reviews before here on 777 Casino will know that poor filtering options are a personal bug bear. Well, there are none at Power Spins. There’s a search function, but that’s about it. Given the attention to detail that we found elsewhere, such an oversight does look a bit bizarre. Punters will enjoy the fact that like BGO, there is no Power Spins promo code needed to get a great bonus. Power Spins doesn’t look much like BGO, and we like that. It’s always seems a bit lazy when gaming conglomerates just rehash the same site with a different name all the time. However, there is one shared characteristic of these two sibling sites – and that’s in the structure of the welcome bonus. BGO have been through a few iterations of theirs. Indeed, they’ve changed it three or four times in 2017 alone. However, following changes to UK Gambling Commission regulations, they have settled on the concept of ‘fair spins’, which are free spins without wagering requirements. It’s those spins that form the core of their welcome bonus (well, all of it actually). And Power Spins follows suit with an identical offer. Oddly, however, they don’t give their rewards a special name like ‘fair spins’. 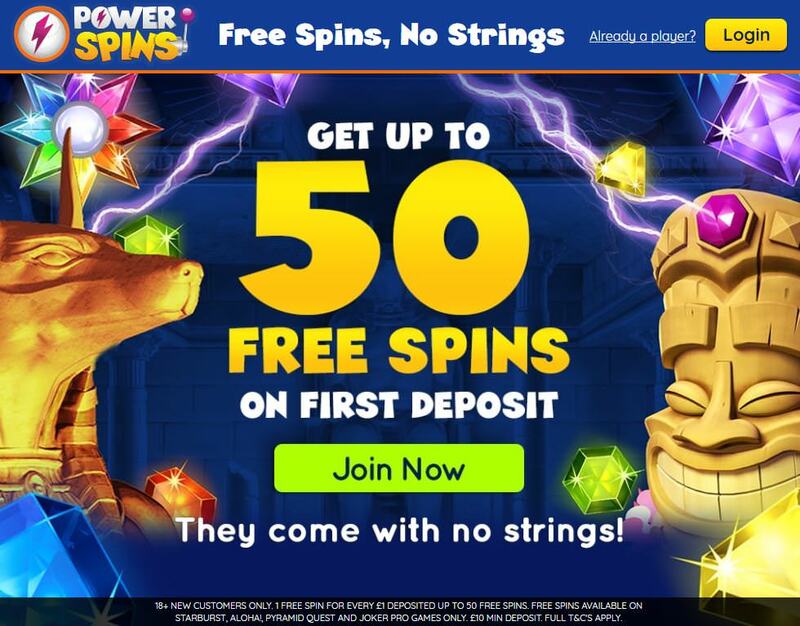 They’re sticking with ‘free spins’ or, to give them their full Power Slots title, ‘free spins with no strings’. The tagline reflects the fact that these free spins are not only wager-free, but they don’t have a maximum win ceiling either. Plus, you get one of them for every £1 you deposit as a new player. So, make a first deposit of £32 and you receive 32 free spins without wagering requirements. A £50 deposit will earn you the maximum 50 free spins. There may not be any strings, but there are a few strands attached to the offer if you look closely. For starters, you need to deposit at least £10 to qualify, although there aren’t many online casinos offering lower minimum deposit amounts than that. Furthermore, you need to use your free spins within 3 days or else they expire. Still, if your free spins generate any winnings, they are yours to keep. That’s the most important factor here, and it’s worth its weight in gold (quite literally, if you get lucky). WHY BECOME A REGULAR PLAYER AT POWER SPINS CASINO? Power Spins incorporates several features which are designed to answer the question Why become a regular player at Power Spins Casino? It’s not an adventure casino with a themed narrative, but they have borrowed ideas from that type of online casino. Hence, you have the power bar and rewards ‘vault’. Remember, every wager you make contributes towards the bar and every time the bar reaches bursting point, you earn a new reward. It’s nothing unique these days, but it does provide you with tangible rewards for your playing time. There are also lots of different promotional campaigns and bonus opportunities to keep you interested. The Power Spins team like their competitions and leaderboard challenges. They aren’t shy of free spins giveaways either. 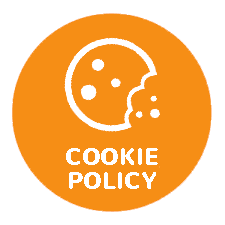 You can expect several promotions to be running concurrently. This isn’t just about the bonuses though. This is also a well designed casino that puts its players first, as evidenced by the vast array of support options. Deposits and withdrawals are processed with the minimum of fuss and Power Spins is licensed by the UK Gambling Commission, and you can always rely on their integrity checks. We haven’t mentioned the handy little introductory video, available on the home page, which explains out the whole Power Spins shebang works. The Power Spins mobile casino adopts a sensible design. It’s reminiscent of the desktop site, with the odd adjustment here and then to acknowledge the limitations of the smaller screen (the promotions banner doesn’t take up anything like the same percentage of the home page for example, which allows the games to take prominence). Their excellent collection of NetEnt and Playtech slots ensures that there’s plenty of choice for those of you who enjoy playing on a iPhone, iPad or Android device. The site generally functions well too. It looks great with its vivid colours and has maintained most of the functionality of the main site, including live chat and the fully integrated help section. You just need to access that from the main menu rather than a link at the top of the page. I did see the Power Spins logo (which appears when a page is loading) more often than I’d like but it would be nitpicking to suggest that it was anything other than a minor distraction. I very much doubt that seasoned mobile casino players would even notice it. Overall, Power Spins have introduced an excellent mobile casino. This is a solid new online casino with very few faults. Yes, you will find more games at other online casinos and there’s no 24/7 customer support. However, Power Spins has covered all bases when it comes to methods of support and their communication is generally excellent. By adopting BGO’s principle of wage-free free spins, they also give you a much better chance to profit from your bonuses. The Power Bar and Rewards Vault adds a bit of interest and site is bright and vibrant without being gaudy or ostentatious. I’ve enjoyed playing and Power Spins and would recommend it as one of the best new casinos for 2017. Withdrawal methods vary according to location, please read the FAQ page for specific details. Credit Cards – 3 to 5 Days / Bank Transfers – 3 to 5 Days / E-wallets Instant. Any withdrawal of less than £500 an additional 2.5% of the withdrawal amount will be charged. The casino is powered by top game software developers. Large selection of video slots. Table games section is somewhat limited. The casino is mobile friendly and will function on iOS and Most Android devices. Be the first to review and rate Power Spins!